Every Goth’s dream come true. 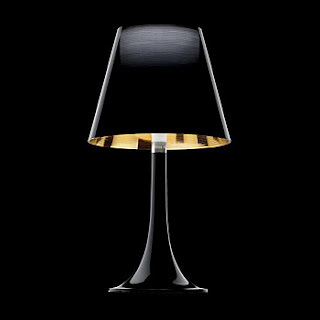 If you´re still intrigued by the Black trend, check-out this website. Don´t forget to read the comments (all very diverse). There´s one in particular that grabbed my attention: (about the black plane) "Looks more like a death plane external, but supra chic interior"
Now that IS the beauty of the Dark: extremely different then interesting. Hi everyone! I´ve already posted some pics of the look I´ve been working on. Well, it´s finished!! It´s one of my most loved ones. Despite looking a bit too victorian I´m still proud of how it looks, specially on a person, not on the mannequin. Have a close look at the textile details! As soon as I finished the rest of the collection, I will post more pics. I don´t know if people have realized the little image I´ve got on the left side of the blog (The small black and white wardrobe pic), so I´ve designed another one that I think it suits better this blog. As you can see, is grey and black. As soon as I figure it out, I will change the head-banner and replace it with this new image. From now on, this will be the THE BLACK WARDROBE logo. Hope you like it! 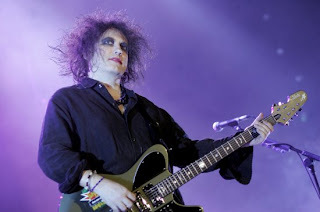 This last Monday, I had the privilege of having been at The Cure´s concert in Barcelona. Absolutely amazing, incredibly long (it lasted from 9.30pm until 1.00am). His voice didn´t go dead in the dark at any minute. He sang very old songs (Primary, One Hundred Years, some songs from the Seventeen Seconds' album) that I wasn´t expecting, as well as the classics like Lullaby, Pictures of You, Boys Don´t Cry, Friday I´m In Love....etc. No Goths (I was stunned), well, apart from a couple of groups of no more than 10people in total. The Arena was absolutely full of people -young and middle-aged-, the sound was amazing but it was a shame that there wasn´t any screens (I was very curious to see if Robert´s make-up was still on place). For all that people who are still thinking of giving money to those fuckers for the London gig, I would just say that it would definetely be WORTH IT but it´s up to you if you want to pay those astronomical prices. Robert Smith is getting old, but his energy is amazing. I will never forget that night and the next time he will do a concert I will make sure to be there...and buy my tickets on time. I can´t remember if I said something about the collection I´m working on at the minute. I´ve started doing brooches with fimo (yes! the fimo spiders!) and now I´ve gone to the clothes. The progress is slower than expected because I rather make a sample twice or even three times until I get the perfect fit and explore all the textures and ideas that the fabrics give me, than doing it "easy" and quick way. 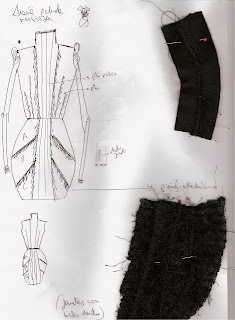 The first picture is the sketch, a simple flat ilustration with the fabric samples and the techniques that would be used on them for that design. I usually draw a very simple sketch and as long as I investigate and work on the finishings and the patterns I updait the sheet by adding more and more specific details about its construction. When the patterns are finished I cut them and place them on the fabric in order to cut off the pieces of fabric. "It seems like Sweeney Todd: The Demon Barber of Fleet Street isn’t the only one doing a bit of butchery! Warner Bros have asked director Tim Burton to ‘butcher’ his own film, cutting it from an R-rated Movie to a PG-13 MPAA. According to reports, the early footage from the film was so violently bloody that the studio executives have become squeamish and have requested the film to be re-cut. In the Film, unsuspecting victims sit in the mechanical chairs of Todd’s barber shop expecting a short back and sides. 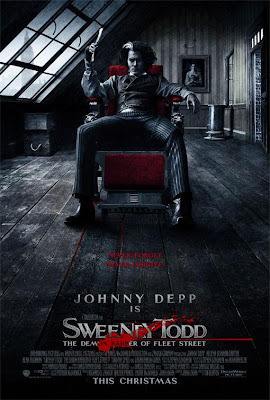 Sweeney then slices their throats before opening a trap door and allowing the bodies to travel into the lair of his wife, Mrs Lovett (Helena Bonham Carter). Once his wife has the bodies, she uses them to make her meat pies".